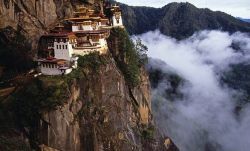 Bhutan is a landlocked country located in South-Central Asia, bordered by China and India. The ‘land of the dragon’ has a population of nearly 800,000 citizens and a total land area of more than 38,300 km2. The capital city of Thimphu has an estimated population of 115,000 people. Bhutan is a relatively sparsely populated country, dominated by mountains, including the Great Himalaya in the north. Dzongkha is the official language, while there are more than 20 other languages, which are linguistically related to the Tibeto-Burman language family. A vast majority of the population practices Vajrayana Buddhism, while Hinduism is another major religious group in the Kingdom of Bhutan. Zow shungo (red rice mixed with leftover vegetables) is among the most famous dishes in the ‘land of the dragon’. The state lottery is the only legal form of gambling in the little kingdom in the Himalayas. Online gambling is also illegal, but there is no evidence to suggest that players of foreign online gambling sites face penalties in Bhutan. Additionally, the government doesn’t restrict access to online casinos hosted in other countries. Bhutanese, like many Asians, love games of luck, and underground gambling is mushrooming, especially in the capital city of Thimphu. It is reported that even government officials visit such illegal gambling parlors on a regular basis. Therefore, it’s not much of a surprise that there are many so-called ‘loan sharks’ that offer loans at very high interest rates. As mentioned, gambling is a widely accepted leisure activity in many Asian countries, including in the tiny kingdom of Bhutan. Due to the gambling ban, locals have massively flocked to underground gambling dens and gaming sites hosted in other countries. In fact, the national lottery is the only legal option for Bhutanese gamblers, which partly explains the popularity of online gambling. The economy of Bhutan mainly depends on agriculture and forestry, while hydroelectricity and tourism are the other main sectors. Bhutan’s gross domestic product (GDP) grew by 6.4 percent in 2012, followed by two years of subdued growth (3.6 percent and 4 percent respectively). In 2015 however, the Bhutanese GDP expanded at a 6.1 percent pace, while growth accelerated slightly (6.4 percent) in 2016. The Asian Development Bank expects a 8.2 percent expansion in 2017, and a 9.9 percent growth in 2018. In addition, inflation dropped to a new low in 2016, which is expected to reach a 4.9 percent level in 2017. The Asian Development Bank forecasts a 5.4 percent rate in 2018. Poverty remains an important issue as about 12 percent of the population lives below the poverty rate. It should be noted however, that the government has made significant gains in reducing extreme poverty from 2007-2012. The government of Bhutan plans to extend the production of hydroelectric power, which will probably reduce poverty even further. Market watchers believe that public private partnerships and subcontracting should boost private investments in the hydropower industry. Nearly 290,000 Bhutanese have access to the world wide web, which represents a 37 percent internet penetration rate, compared to 5.9 percent in 2007. Almost needless to say that an increasing number of internet users in the Himalayan kingdom of Bhutan use a mobile device. If you add the local craze for gambling and the lack of legal options, it comes as no shock that online casinos are hugely popular with Bhutanese. How to deposit money in an online casino when I’m from Bhutan? Ready to enjoy the pulse-racing excitement of internet gambling after reading our “online casino Bhutan” page? Join Royal Panda and get a 100% first-deposit bonus!